A gorgeous set of completely modernized executive suites in Fort Collins. Each office to lease benefits from cutting edge internet and communications technology, ample free parking, onsite property manager, state-of-the-art conference facilities and dedicated catering area. These suites are easy to access from Denver and the surrounding area with excellent proximity to the highways. This center is located right next to Colorado State University. You can visit the many nearby shops and restaurants right outside of the center. Take a chance to experience the downtown environment in this fun city. Stop in and visit one of the on-site management team members to find what space is best for you. 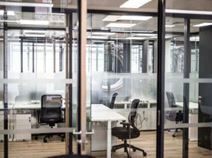 From coworking to private offices, there is a fit for you and your team. Let this center meet your business needs.